Sit down for this shocking announcement... consumers are continuing to use their mobile phones more and more. So, that's not shocking news. You are probably reading this blog post on your phone right now. But, the one thing we should really dive into is that the search engines have taken notice and the writing is on the wall for what's to come. Let's take a look at what will be important for SEO in 2017. The search engines are in the business of making their product the best they can. If Google cannot serve up awesome results for keyword searches, they know you can switch to Yahoo and Bing. Just like you and I, we want our product / service to be better than the competition. As mobile use for searches continues to climb, the search engines want to do everything they can to make sure they serve up the best out there. 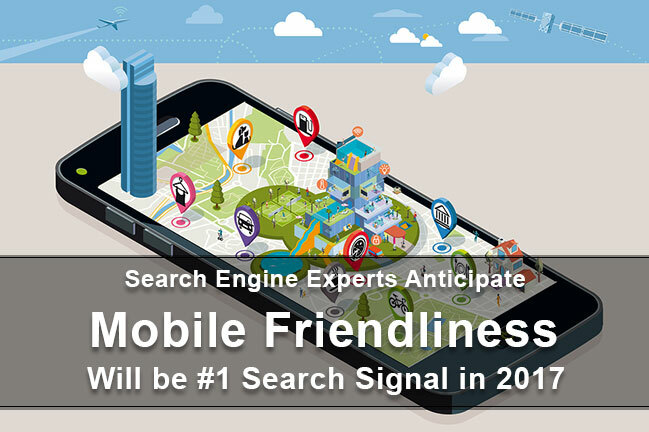 This is bringing a lot of attention to search signals related to mobile friendly websites in the near future. A search signal is any characteristic of a website that the search engines can use when deciding where they should place the pages that compose the website within its index. They are units upon which a website is measured. Google has over 200 ranking signals within its algorithm that determines how and where each of the 30 trillion pages in its index appear for keywords searches. In April of 2015, Google announced a penalty for sites that were not mobile ready. This update to the algorithm meant that sites which were mobile friendly could outrank sites that were not in mobile searchs. Once again, Google trying to make its product better. Around the same time, a project called Google AMP was being launched. AMP Is short for Accelerated Mobile Pages. There is a direct correlation between bounce rate and page load time. Longer page load times lead to higher bounce rates. The AMP project is aimed at drastically reducing the load time on mobile through use of an architecture focused on providing all the aestically pleasing elements we expect to see while realizing a faster load time. Finally, we get to have our cake and eat it too! We look to the industry experts for guidance on what they think will be the factors that will be important in the future. "Page speed must be on the 2017 roadmap if your site has load issues. Speed directly impacts ranking and conversion. More than 50% of the global search queries are executed on a mobile device. Do you really want to only reach half of your revenue earning potential?" "We’re already in the mobile-first generation, and both mobile optimization and mobile strategy are going to be key for most websites moving forward." "The top 3 SEO trends for 2017 are mobile, mobile, mobile. The world is going mobile, and as it does, the tail will begin wagging the dog. By the end of 2017, I expect that even desktop searches will be influenced by mobile optimization." I'm not going to sugar-coat this... SEO is much more complicated than optimizing your site to be mobile friendly. Remember that Google's algorithm measures over 200 signals. We are just talking about the one the SEO Experts think will be pretty important in the future. Begin conversations with the people making enhancements to increase your search engine exposure and make sure they are aware of these upcoming trends and you are properly setup. If they do not have a game plan for this ready for you, find someone that does.